2nd Friday of the month, September through June, evening. Sunday, May 6, 2018, 12:30-3:30pm. NEW DATE: Nov 4, 2018. 4th Friday of the month. Talk to a member for details. Are you interested in learning to tell stories? 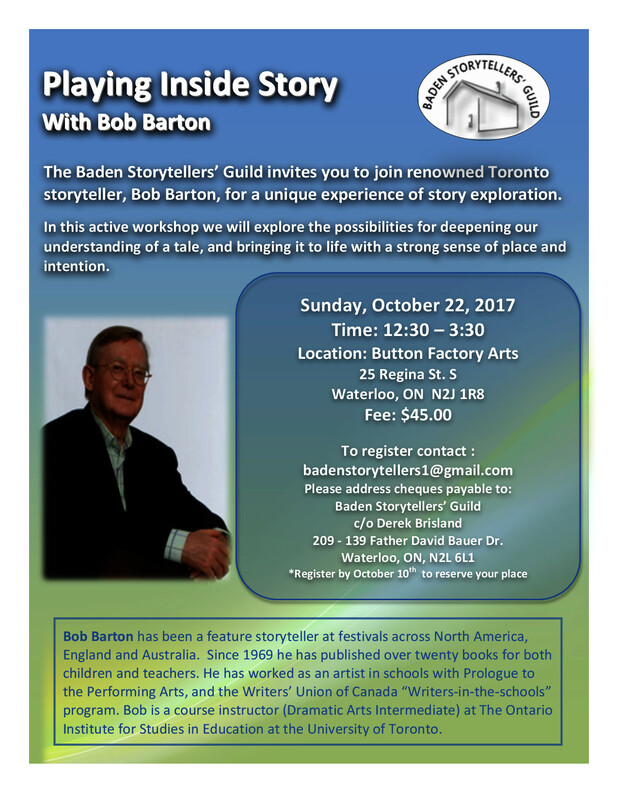 This workshop will cover the meaning of oral tradition; what makes a good story; exercises in telling and where to find stories. This will start you on your way to the mic at Stories Aloud or a family reunion or a gathering of friends. We look forward to hearing your stories! Please register by May 20, 2018 to reserve your place at the workshop. Tickets: $15. Door is cash only. 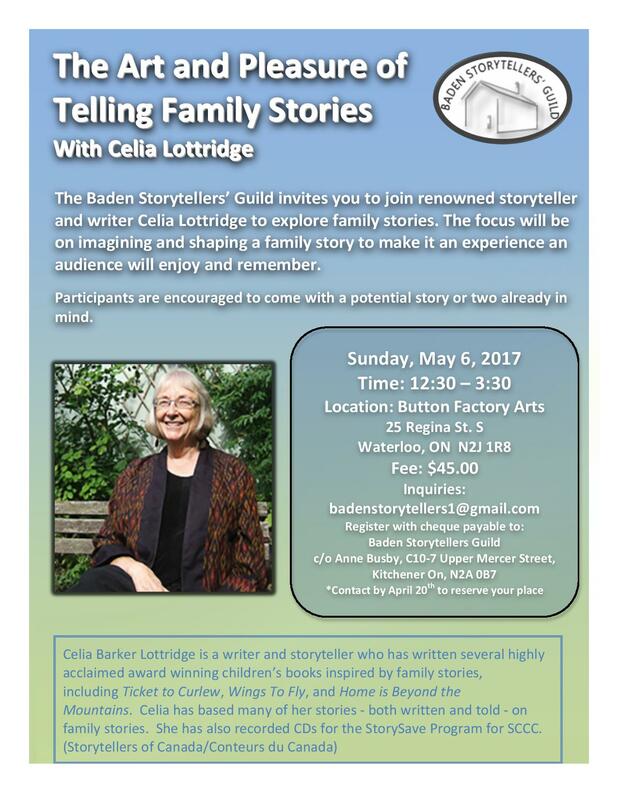 Join renowned storyteller and writer Celia Lottridge to explore family stories. The focus will be on imagining and shaping the story to make it a story an audience will enjoy. Participants are encouraged to come with a potential story of two already in mind. Fee is $45. Please register by April 20, 2018 to reserve your place at the workshop. Celia Barker Lottridge is a writer and storyteller who has written several highly acclaimed award winning children’s books inspired by family stories, including Ticket to Curlew, Wings To Fly, and Home is Beyond the Mountains. Celia has based many of her stories –both written and told on family stories. She recorded CDs for the StorySave Program for SCCC. (Storytellers of Canada/Conteur Canada). Second Friday of every month, September through June, 8:00. Doors open at 7:30. It’s the Story Barn experience in a new venue with the same open storytelling charm. Bring along $5 and a mug for hot apple cider. Stories begin at 8pm. You are welcome to come to listen, but if our story charm should work its magic, you are welcome to share a tale. In this active workshop we will explore the possibilities for deepening our understanding of a tale, and bringing it to life with a strong sense of place and intention. Fourth Friday of every month, September through June, 7:30. Annual dues and membership. Our tellers have a wide range of experience. We practice telling, learn about the art, prepare concerts, and share information about storytelling events. We also have potlucks. Come prepared to share an event, a moment, a person, or a story that has been a signpost on your way as a storyteller. We anticipate a rich conversation with opportunities to consider our strengths, where they have come from, and what directions they will take us in the future! Are you interested in learning to tell stories? This workshop will cover the meaning of oral tradition; what makes a good story; exercises in telling and where to find stories. This will start you on your way to the mike at Stories Aloud or a family reunion or a gathering of friends. We look forward to hearing your stories! Do people and events of the past intrigue you? Are you a storyteller, a writer, or simply a lover of history? If so, Join Mary-Eileen McClear as she shares her methods for finding, crafting, and telling historical stories. Expect to explore ways to peer into the past and bring it to life in an authentic, engaging way. 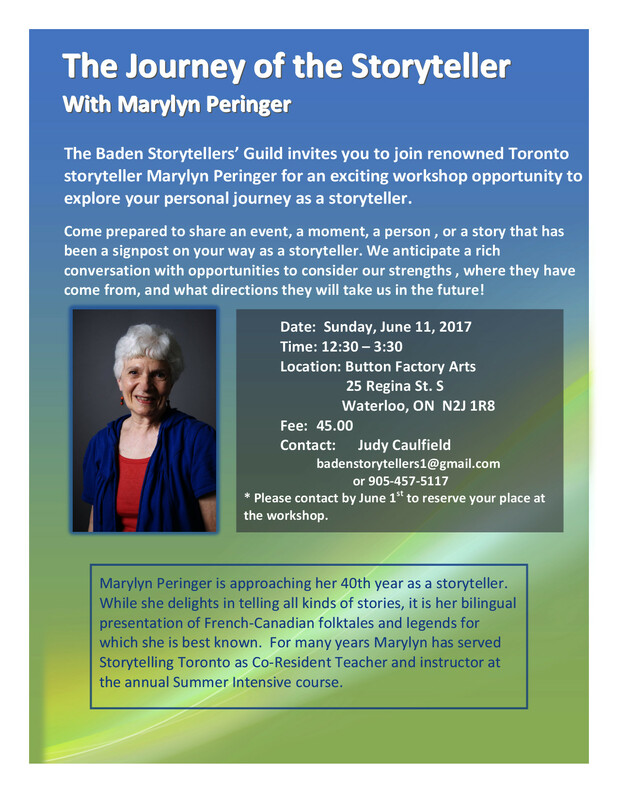 Mary-Eileen McClear, a storyteller for more than 30 years, is the founder of the Baden Storytellers’ Guild and The Story Barn. She takes delight in ferreting out stories based on real people in times past.